7 Bedroom House For Sale in Crowborough for Guide Price £1,500,000. 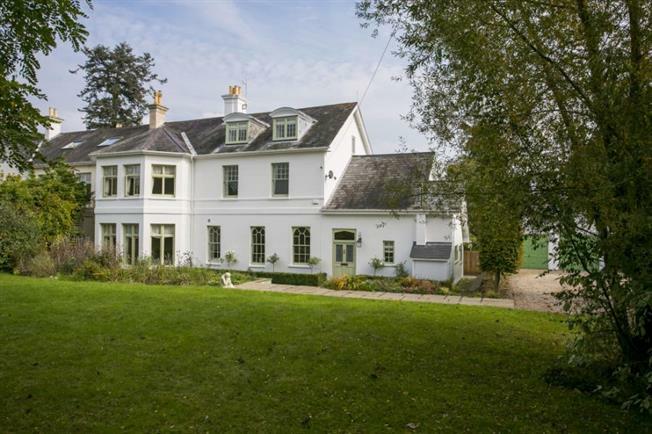 A substantial attached late Victorian Country House offering over 4500 sqft accommodation which has been fully restored to an exceptionally high standard, set in a secluded setting on a quiet country lane with landscaped gardens and grounds of circa 2.5 acres. Park House is a fine example of late Victorian architecture and has more recently been extensively refurbished and extended by the current owners with no expense spared. The accommodation enjoys high ceilings and a wealth of character features throughout, and comprises a welcoming entrance hall with double coat cupboard, downstairs cloakroom, family room with floor-to-ceiling doors to the terrace and planning permission to extend, a stylish country kitchen/dining room with new electric AGA, butler sink and beautiful original arched windows. The magnificent drawing room enjoys original detailed coving, open fireplace and full-height windows. There is a fully custom-fitted library with sliding step-ladder, a separate study with planning permission to extend, utility room, boot room and laundry. From the rear lobby, the oak staircase rises to the first floor landing where there are four double bedrooms, two modern luxury bathrooms, a separate W.C and a store room with planning permission to add a dormer window and make into a further bedroom. The spacious master bedroom is a particular feature with a large bay window, dressing area and luxurious en suite bathroom. To the second floor there are a further three double bedrooms, modern shower room and walk-in loft space. The property is approached via a private tarmac lane leading to the private gravelled driveway. The front garden is mainly laid to lawn with mature flower and shrub borders and a paved terrace adjacent to the house. To the side of the house there is additional parking infront of the detached double garage, oil tank, new boiler and log stores. A large paved terrace spans the width of the rear of the house, with steps leading down to the landscaped rear garden, with hedge borders and areas of lawn interspersed with mature flower beds. To the rear and side of the garden there is a large pony paddock. Total plot circa 2.5 acres. Park House is conveniently located in an area of outstanding natural beauty on the northern edge of the Ashdown Forest, close to Tunbridge Wells and equidistant between the historic village of Groombridge and Crowborough, with its wide range of everyday shops and services. Tunbridge Wells, some 6.4 miles to the northeast, offers a wider range of high street shops together with an excellent choice of leisure and entertainment facilities. Mainline rail Tunbridge Wells (about 7.1 miles) to London Charing Cross and Cannon Street from 47 minutes. Hildenborough (about 11.3 miles) to Charing Cross and Cannon Street from 40 minutes. State and private schools There are many highly-regarded schools in the area including Holmewood House (Langton Green), Ashdown House (Forest Row) and Rose Hill (Tunbridge Wells) preparatory schools, Kent grammar schools in Tunbridge Wells and Tonbridge and independent secondary schools in Tonbridge, Mayfield, Ardingly, Hurstpierpoint, Sevenoaks and Eastbourne. Communications The M25, accessed via the A21, links to other motorway networks and thereby Gatwick and Heathrow airports and the Channel Tunnel terminus.